Increasing the operating temperatures of gasoline engines increases their efficiency, resulting in more miles per gallon for each tank of gas. However, the higher temperatures accelerate corrosion of engine parts, such as the engine valves, due to the combustion gases inside the engine cylinders. The goal of this project is to develop an advanced computer tool, the Stainless Steel Alloy Corrosion (SStAC) tool, which will predict the corrosion of valve steels during engine operation. The SStAC tool will include the impact of the steel microstructure on corrosion, and will be developed with new information obtained from advanced experiments and lower length-scale simulations. 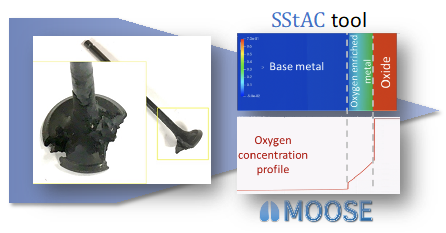 The SStAC tool will analyze material behavior in harsh environments. This new computational tool will assist in part design, reducing costs by eliminating the need for conservative design and enabling alloy optimization to improve corrosion resistance. As a result, it will help reduce costs for existing engines and will assist in the material and engine design for the engines of the future, reducing the development time by years. Dr. Tonks’ project was one of 42 selected by the DOE in 2018. The projects will support advanced vehicle technologies that can enable more affordable mobility, strengthen domestic energy security, reduce U.S. dependence on foreign sources of critical materials, and enhance U.S. economic growth. This work supports DOE’s goal to invest in early-stage research of transportation technologies that can give families and businesses greater choice in how they meet their mobility needs. 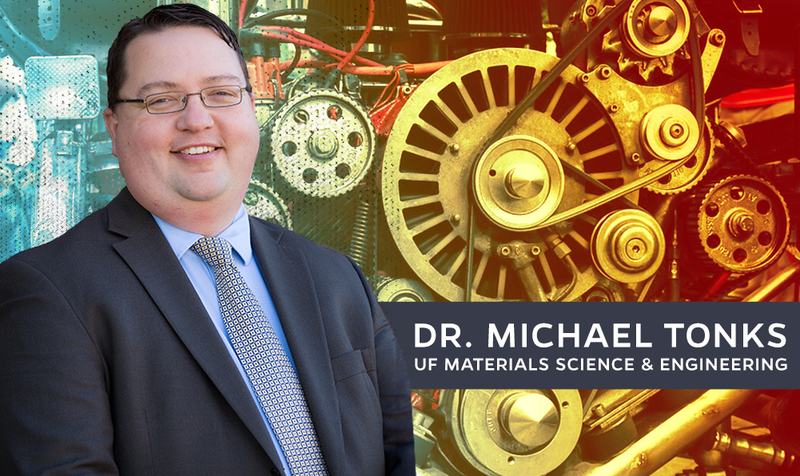 The Tonks Research Group at UF investigates material behavior in harsh environments. The microstructure of a material has a large impact on its properties and performance. However, the microstructure evolves in materials in harsh environments, changing the properties and typically degrading the performance. “In our lab, we use mesoscale modeling and simulation to predict the co-evolution of the microstructure and physical properties of materials in harsh environments. We also seek to understand the mechanisms governing this evolution,” Tonks said. Dr. Tonks has received several honors and awards in recognition of his research, including the prestigious 2017 Presidential Early Career Award for Scientists and Engineers.